The Royal Commission into Institutional Responses to Child Sexual Abuse handed down its final report on Friday 15th December 2017, following five years of public hearings. In order to address the impact of poor record keeping on children in out of home care, and to assist those who were in ‘care’ as children who are now seeking records, the final report of the commission includes a number of recommendations. The commission also recommends that all records relating to abuse should be kept for a minimum of 45 years, to take into account the time it can take for people to come forward about abuse. The commission identified that inadequate records and recordkeeping have contributed to survivors’ lack of information about their childhoods and frustrated their abilities to take legal action or apply for redress. It acknowledges the anger, frustration, distress and trauma that records (and their absence) can have for survivors. The Volume highlights the impact of the lack of records have on survivors, including not having key identity documents such as birth certificates; not having any evidence of being in a particular institution during their childhoods; and no records about abuse, even when the abuse had been reported. Survivors reported examples of minimal records being created, despite being in out of home care for long periods of time. Information about why they were initially placed into ‘care’ was inaccurate or misleading, and made judgemental comments about their families. The report highlights the importance of properly maintaining records after their initial creation, and notes that many organisations have vast quantities of records but because of poor maintenance, “their content is unknown” (Volume 8, p.50). It highlights initiatives such as the Find & Connect Records Access Documentation grants as a way for organisations to improve access to their records. The report places a strong emphasis on sharing information about abuse between institutions and governments to “identify, prevent and respond to incidents and risks of child sexual abuse” to prevent perpetrators being moved between institutions where they can harm more children. It would also share information about children and students, to provide support to those who have been abused, and also to acknowledge that some children may pose a risk to others. This focus is in large part due to the testimony and advocacy of Care Leavers and Forgotten Australians. Those children were not believed, abuse routinely covered up and abusers moved elsewhere, driving a strong desire to ensure that safeguards be put in place for those experiencing out of home care in the future. Currently, state and federal governments have different laws, and there is confusion around how to implement them. The commission recommends a “nationally consistent scheme for sharing information related to the safety and wellbeing of children between key agencies and institutions to improve information exchange within and across different sectors and jurisdictions.” This would address that confusion, and strengthen safeguards for children. regulatory and oversight bodies with statutory responsibilities relating to children in care. And cover foster carers, relative/kinship carers and residential care staff. Volume 11 provides an overview of survivor’s experiences from the private sessions, public hearings, written accounts and research, of child sexual abuse in residential institutions from World War II to 1990. It includes many individual quotes and accounts and specifically mentions the experiences of Forgotten Australians, Aboriginal and Torres Strait Islander children, Child Migrants and children with a disability. While most of the institutions have now closed, the royal commission acknowledges that for the survivors of these institutions the impact remains. Family re-unification is also impacted heavily by the failures in records and record keeping, both historical and present-day. The Australian Government should establish and fund a legal advice and referral service for victims and survivors of institutional child sexual abuse. The service should provide advice about accessing, amending and annotating records from institutions, and options for initiating police, civil litigation or redress processes as required. Support should include advice, referrals to other legal services for representation and general assistance for people to navigate the legal service system. The royal commission website has become an important resource for those who experienced institutional ‘care.’ It holds their stories, their voices, and for many records the first time they spoke of, and were believed about, their abuse. The Australian government should host and maintain the royal commission website for the duration of the national redress scheme for victims and survivors of institutional child sexual abuse. A national memorial should be commissioned by the Australian government for victims and survivors of child sexual abuse in institutional contexts. Victims and survivors should be consulted on the memorial design and it should be located in Canberra. The commission also notes that records will be important to a redress scheme. 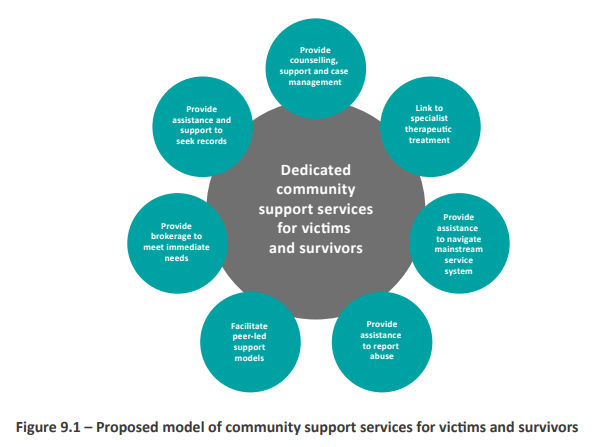 The information survivors provided to the royal commission will be of use to survivors who want to apply for redress. It may also be of use to survivors who want to make a civil claim or criminal complaint. It is important for a number of reasons, that the government agency that becomes the custodian of the royal commissions’ records should maintain ongoing access to records that contain information given by survivors.